These majestic animals have been taken from the wild and locked in tiny holding pens bear the city of Nakhodka in Russia. According to UK Whales, this is the largest number of marine mammals to be held in such a manner and the location is said to be currently under investigation. It has been speculated that these animals, in general, were most likely captured to be sold to Chinese aquariums through a loophole of some kind. While permits for capture are only issued in regards to educational or scientific reasons many seem to be getting around that. It has been reported that the four companies renting these ‘enclosures’ where the animals are being kept exported 13 orcas to China from 2013 to 2016. Whale trafficking seems to be a big issue in Russia. 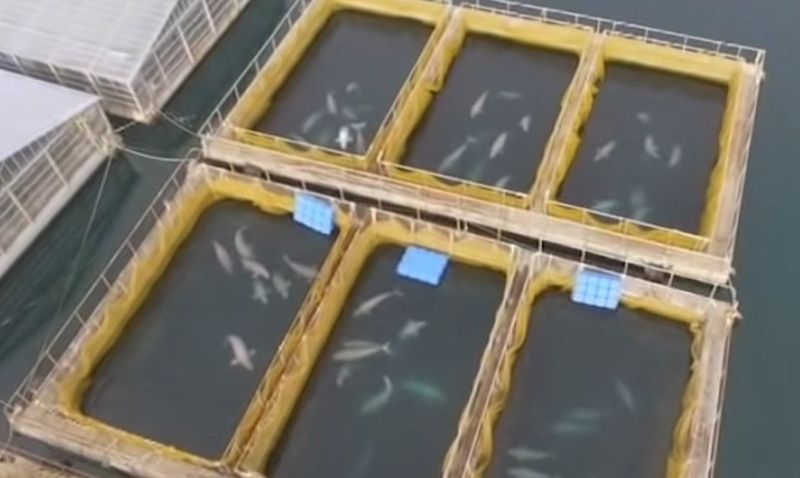 Drone footage has been caught of these animals from above and according to The Telegraph, a video of a whale being lifted into a shore tank by crane has also been captured. Capturing these creatures at this level for any reason can be damning to their population levels in the wild. It seems most of the animals in this specific area are infants and capturing whale calves (or baby orcas) is basically forbidden. What they are doing is literally torture as you can see based on the size of these pens. This whole ordeal is quite heartbreaking. We can only hope that these poor animals are freed sooner rather than later.